With Samsung UGEO PT60A, higher levels of accuracy and efficiency in diagnosis and treatment are possible, along with greater reliability thanks to an extended 5 year warranty. Reduce uncertainty and improve the patient experience thanks to a compact, ultra-portable design providing an ergonomic delight to clinicians. Adjust settings to achieve enhanced imaging in a simple fashion thanks to the intuitive control of a capacitive touch screen. Using pinpoint precision, Needle Mate delineates needle location when performing interventions such as nerve blocks, corticosteroid injections and PICC line insertions–allowing clinicians greater accuracy and efficiency for diagnosis and treatment. Enjoy superb image quality on the high-resolution 10.1" touch screen LED monitor. With sharper vision and intuitiveness, you can increase diagnostic confidence for improved clinical decision-making. And LED uses less power for greater efficiency. A highly durable and multi-touch functional touch screen delivers faster reaction time. And it can be operated with gloves for practical versatility. So even ICU, operating theaters, ambulance and emergency departments can enjoy greater efficiency. 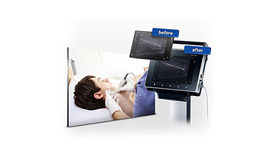 Improve the patient experience thanks to SDMR from Samsung. Implement rapid and precise diagnostic procedures with high-resolution 2D image quality, increased edge enhancement and speckle noise artifact reduction for greater diagnostic confidence. 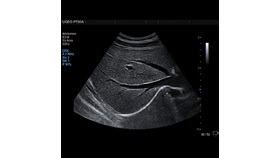 SCI steers ultrasound beams and compounds scan lines to greatly improve the signal-to-noise ratio, enhance resolution and improve clarity in soft tissue planes. Enabling more rapid diagnosis with higher levels of accuracy, you can be more confident. 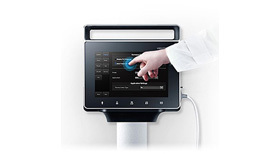 At the touch of a button, QuickScan helps to streamline patient flow and efficiency. By enabling automatic optimization of key imaging parameters, you can devote your medical attention to more accurate diagnoses and improving the quality of care. The docking cart incorporates 3 extended active probe ports so you can enjoy greater usability and versatile connectivity for your examination needs, while a small micro probe connector leaves more room on the machine for efficient use of space. 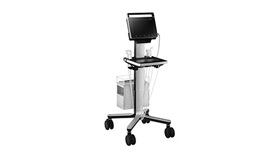 The docking cart incorporates 3 extended active probe ports so you can enjoy greater usability and employ versatile connectivity for your examination needs. And a small micro probe connector leaves more room on the machine for efficient use of space.